This is an excellent post, and I will be ordering Tony’s book. Thank you for the suggestion. 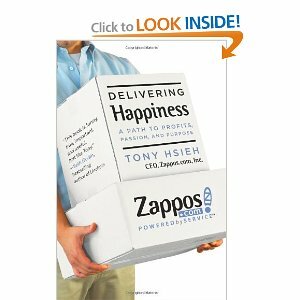 I believe that how zappos is ran is a great example of how the world can be changed through taking steps to ensure that everyone is happy with the results. Do you know whether their company will be effected by the sale to amazon? One last point – I think that one of the biggest things that caught my eye was that they choose to use a calling center in the states rather than overseas. I think if more companies to the time to do this our economy would perhaps be able to develop more jobs locally. After all based on zappos story in the end it led to greater profits not less. Thank you for sharing this wonderful story. Very interesting. It would be nice if more companies took a page from Zappo’s way of doing business. It seems that in today’s business world most companies are delivering substandard customer service and are squeezing their employees so hard that they are creating numerous dissatisfied employees who do their jobs with the only goal being to find new employment with a less stressful taskmaster. Good website! I really love how it is easy on my eyes and the data are well written. I’m wondering how I might be notified whenever a new post has been made. I’ve subscribed to your feed which must do the trick! Have a great day! “A crime which is the crime of many none avenge.” by Lucan.